I help businesses with all types of websites. However, about 75% of my customers use WordPress. I also have six WordPress sites of my own. So it’s safe to say that I know my way around a WordPress installation. In one-on-one WordPress coaching I’ve seen how delighted people are when they learn to how take care of their own websites. They’re amazed at how easy it is to update pages and add blog posts. I wanted to find a way to help even more people with WordPress. So I decided to write a book. 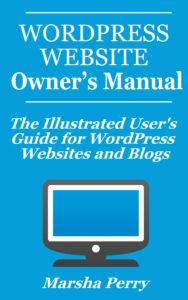 The WordPress Website Owner’s Manual: The Illustrated User’s Guide for WordPress Websites and Blogs goes over the items contained in my one-on-one WordPress coaching sessions with clients. It also has information on updating WordPress, picking out plugins and a lot more. Whoever said “a picture is worth a thousand words” was right on the money. So the book is an illustrated manual with tons of images. I’d humbly point out that this is one of the few WordPress books written by someone who spends a lot of time talking to users of WordPress instead of WordPress developers. There’s no technobabble in the manual. Please Note: This book is for people who already have WordPress websites. It does not contain information on installing WordPress or customizing themes. That, my friends, is another book. Previous Post: aMember Update – Still Using aMember 3? Here’s Why You Should Update!